Happy 2019 everyone, I hope you had a wonderful Christmas and New Year. Ideas always start off with sketches and helps customers visualise the designs. Gently whittling away at the wax to reveal a wishbone shape. After casting, the rings needed some further refining, with a setting soldered on for the gemstone. 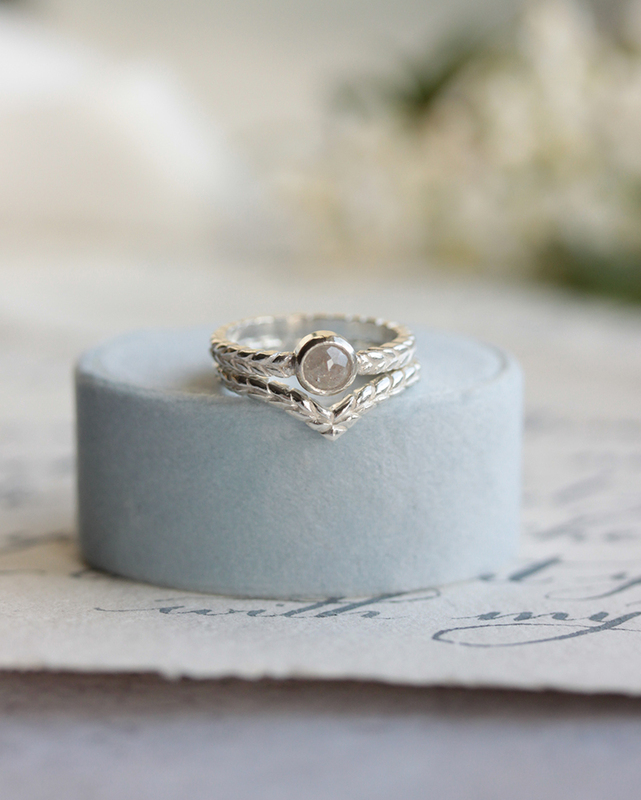 An ethereal opaque diamond was chosen for the stone, to suit the bride’s cool and muted colour preference. Here are the finished rings, I hope you like them! Hi everyone, I hope you’re all well. Autumn has been beautiful here in the UK and it’s been wonderful to watch the shift in seasons in (mostly) glorious sunshine. I love this time of year, from the crisp autumn leaves to the sculptural forms of seedbeds and pods; nature never fails to inspire me with new ideas for jewellery. I had a wonderful commission recently from a customer who wanted a little wren necklace for his Granddaughter whose middle name means wren in Irish. He already had our swallow necklace for his other Granddaughter and the wren would make a matching set for each of them. 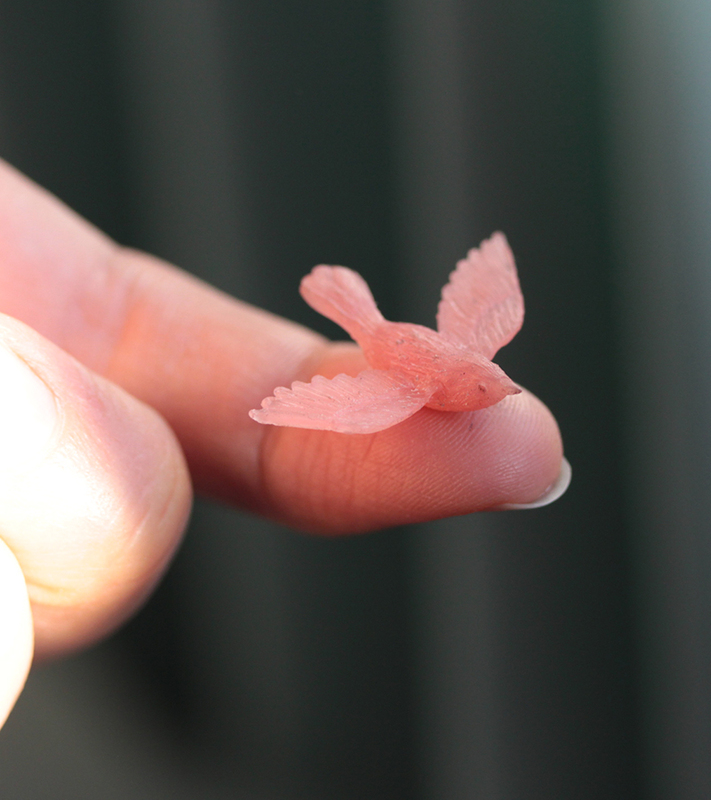 After sketching some ideas we decided to go for the wren in flight and I carved away at some jeweller’s wax to make a teeny wren bird. I love the detail I was able to achieve at such a small scale. Little wren carved in wax ready for casting. Little wren cast in sterling silver. Making jewellery like this is wonderful. I will always remember making bespoke and personal jewellery the most. It’s the stories behind them that makes them so special to create; jewellery that is meaningful and symbolic that can be treasured for years to come. Hello! I hope you're all well and enjoying summer? I'd like to share some new designs with you all, I've recently added some new pieces to my celestial range. I love watching the stars and moon this time of year, there's nothing more beautiful than stargazing on a warm summer's evening. I was so inspired by pieces I've seen online from the Met Museum's "Heavenly Bodies" exhibition, especially the exquisite textures and details from the Byzantine Empire, and the way these translate into contemporary fashion design. I only wish I could go there in person to see the show in real life.... but for now I have been watching videos and slideshows in awe. The exhibition's theme is fashion inspired by the Catholic religion, with many highly detailed artefacts and fashion designs on show. I'm really drawn to the designs in opulent golds and reds, it's such a beautiful colour combination and I think that's why I love gold with rubies and garnets so much! Byzantine cross, from the Met Museum's Heavenly Bodies exhibit. I wanted to experiment with intricate textures and so designed some crescent moons with both engraved details and relief. Here is one of the moon designs in wax form, before it was cast in silver. Crescent moon hand carved in wax. I was really pleased with the way this turned out as it was hard to imagine it in silver. I also etched in a secret message on the back of the pendant, "a la luna", meaning "to the moon". I love the secret language and symbolism of jewellery and thought this would be a special sentiment for its wearer. 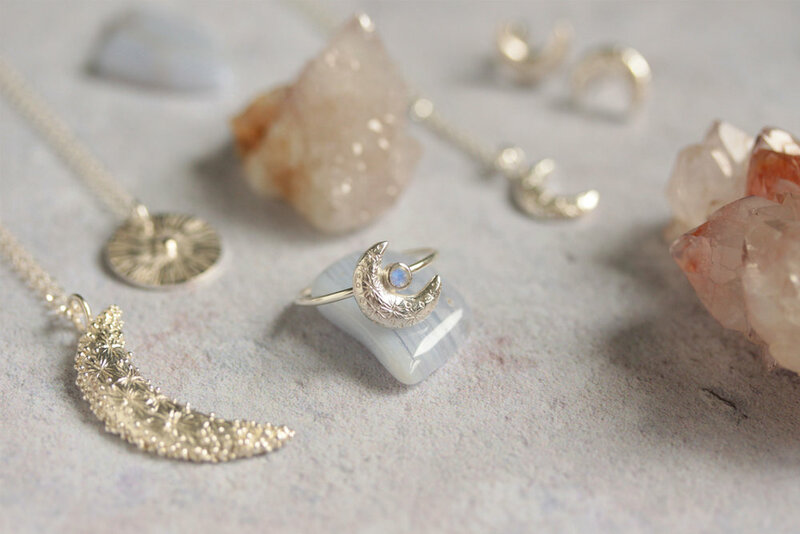 I created another little moon which I've made into a ring, pendant and earrings, and also a simple textured disc pendant set with a tiny white sapphire. Here are some of the new pieces together. I've also carved a teeny tiny north star in wax, I'm not sure what it will be like in metal just yet, but will post an update if I decide to add it to the shop. I've also got a few new ring designs that I'm waiting to come back from casting, and hope to add some of these to the shop for Christmas. North star in jeweller's wax. I hope you've enjoyed reading about my design process and that you like my new pieces. Wishing you all a lovely week and will post another update here sometime soon! Hi all, I hope you had a wonderful Royal Wedding weekend! I'm sure many of you were watching, I loved seeing people's wedding party photos and photos of friends who were brave enough to go and watch from Windsor. What were your favourite bits of the wedding? I loved the beautiful gospel choir and the bride's veil was just breathtaking, the floral details were incredible and I loved the symbolism within it too. I've been making a fair bit of jewellery for wedding season too! 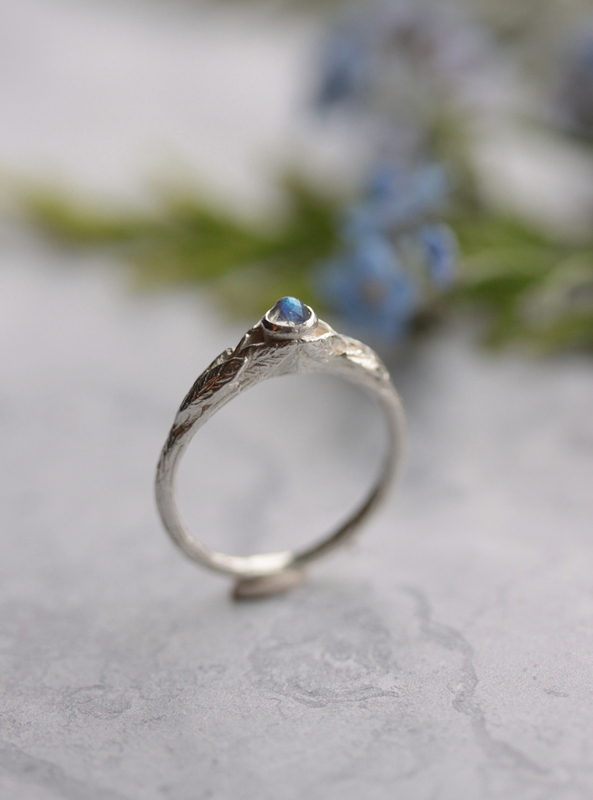 I had the pleasure of making a fern ring for a bride to be, I was so touched that she chose this design for her forever ring. 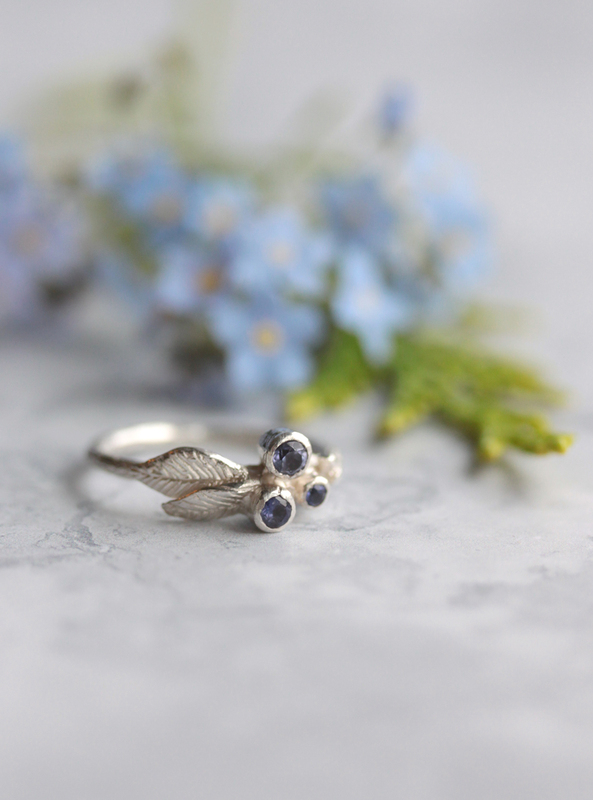 The fern leaves symbolise the secret bond of love, which is perfect for a wedding band. I also got contacted by two lovely ladies who had recently got engaged and wanted a gold ring each to wear. It was a privilege to make them and I loved their simplicity. Elegant gold bands set with moonstone and chrysoprase. What means the most to me is that these pieces symbolise love; this is my favourite thing about making jewellery. I have also been making a lot of wedding bouquet lockets, which are always very special to make. Many of these are to remember lost loved ones on the special day, the inscriptions are always incredibly moving to read and I hope that they bring a little comfort and many happy memories. Congratulations if you are recently engaged or married, or are planning a wedding soon! I always love hearing about wedding plans and making wedding jewellery is so exciting. Feel free to get in touch if you have an idea for something special for your wedding day or wedding anniversary. 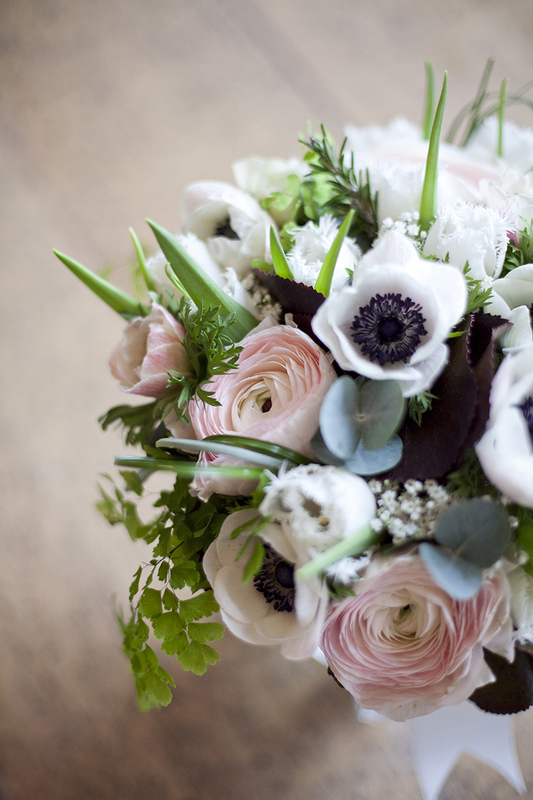 My wedding bouquet from the big day 5 years ago- floral perfection! Photography by Emma Sekhon. Hi everyone! I thought I would share a really lovely commission I did back in March. A historian friend in the US asked me to make her a silver poppy brooch to wear to some World War I events she was attending this year. It was such a special piece to make and a real honour to create a symbol of peace to mark 100 years since the First World War. I made the base of the brooch in jeweller's wax before having it cast it silver. The casting was then tidied up before soldering a setting to hold the red garnet for the centre and pin for the back. I like sharing my work in progress photos- I hope you find them interesting! Hi everyone! Hope you are enjoying the first signs of Spring- I'm certainly feeling more cheerful since the sun started to shine and daffodils popped up in the garden. I have some new woodland rings in the shop which were inspired by my walks during the winter time. It was dismal trudging through the mud with the dog every morning, but this made me notice the colours of the berries and glistening dewdrops- Mother Nature doing her thing when it was least expected! So whenever I had the chance I doodled down some ideas in the hope that I could start making some designs in the new year. 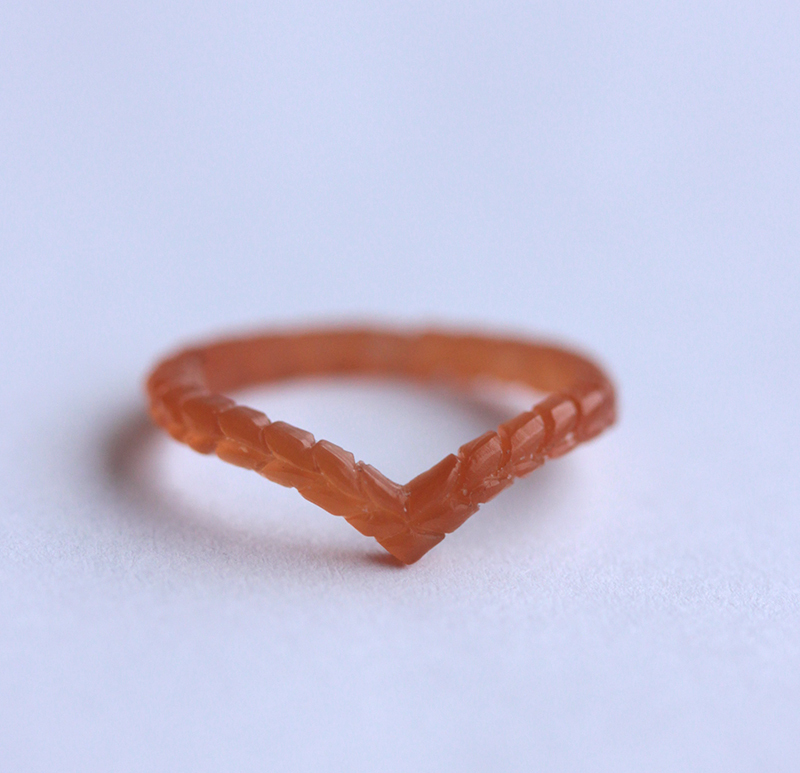 I carved a few different ring designs in jeweller's wax. I hadn't made many wax castings for stones so it was a bit of a learning curve. I was pretty excited to get the castings back. I had already chosen a few stones to set- deep red garnets and rubies and blue iolites to depict berries; and iridescent stones like labradorite and moonstone (my favourites!) to portray glistening dew drops on branches. I was really inspired by the lichen on the bare branches and loved building up these organic textures for these lichen rings. I love how the colour of rubies and iolites compliment gold and silver- the colours are perfect for depicting berries on winter branches. I hope you like them! I'm currently in the process of making a few new celestial jewellery designs and hope to share these with you over the next couple of months. Hello! I hope you guys are well and winding down for Christmas. I've been busy non-stop with orders since November, which is fantastic. I am so very grateful for each and every order I receive. When I say I put all my love, energy and effort into running this business, I truly mean it! I've been longing for more of my own space for a while (I was previously sharing a workspace with my husband Jay), so we decided to renovate the coal shed beside our house. It's a small space, but enough for me to work in, it's safer than working in the house, and I love that I can walk away once the day is done; I am sure many small business owners working from home can relate! I have a wonderful new workbench that I invested in from Durston, it's an absolute dream, loads of space to get creative and messy; the best thing I have bought in a long time. I just love it. I've added a few of my favourite things to display, jewellery old and new, and little nicknacks that I have collected over the years. I've put up a few really special things, like the beautiful poppy painting given to me by my wonderful artist friend, Jessica Eldenstjärna and my favourite moon print that I received from an Instagram product swap with Agnes at We Are Stardust. It's not the biggest space in the world and I share it with the washing machine (we've decided it's a utility room for whenever we decide to move house!) but I feel like the luckiest girl in the world to have the luxury of my own creative space. My business has grown this year and that I have a proper workshop, I feel more motivate and inspired than ever! I hope you all have a wonderful Christmas and New Year. Thank you for supporting my small business, it really means the world. Wishing you a joyful 2018! Hi all! I have been pretty quiet here on the blog lately, but I have some lovely new products and ideas I would love to share with you over the next few months. I've had a lovely time away in Cornwall recently which was a much needed break. Life had given me some challenges, work was getting tiring and I just needed a break! So we packed our bags with poochie in tow and headed off to St Agnes. I can't begin to tell you how beautiful it was, the weather was stunning and the sea so calming and healing. St Agnes is a beautiful part of Cornwall, its dramatic coastline steeped in mining history and smuggling. I'd really recommend visiting this beautiful part of the country! We also visited Perranporth which was very close by with an amazing long beach, and spent a day in Truro, a lovely Cathedral town with gorgeous shops and cafes. I've shared some of my favourite pictures below. The sweetest cottages along the coast at Trevaunance Cove. The path down to Chapel Porth Beach. Our dog had the best time! Heather and gorse carpeted the cliff tops. So stunning. Hi everyone, can you believe its nearly the end of May already, these last few months have whizzed by! I've been very lucky and have recently had two amazing holidays to Valencia and Naples, both very beautiful cities, and wonderful memories made with friends and family. I've been meaning to write about a skill swap day I did with Denya, jewellery designer and founder of Upside Down Tree Studio, because it was such a brilliant opportunity to connect with another creative and share our skills and form a new friendship. I got to know Denya over Instagram and we had talked about meeting up for a while. When Denya asked if I wanted to meet to do a skill swap day I jumped at the chance, the thought of sharing our skills really appealed to me. Denya works in precious metal clay which I was keen to learn more about, and Denya was interested in developing some wax carving techniques. Take a look at some of Denya's gorgeous jewellery designs... aren't they stunning? The detailed textures on Denya's feather pendant are exquisite. The most delicate daisy earrings. So dainty and are on my wishlist! On the day of our skill swap I drove through the beautiful West Sussex countryside to Denya's home where she made me feel instantly welcome. We hit it off straight away and spent a lot of time chatting over a shared love of jewellery design and creativity in general- she also showed me some amazing ceramics she had created at a previous skills swap day with a potter, they were beautiful! Denya is really keen to take the concept of skill swap further which I think is such a wonderful idea; I've mentioned it to several other designer friends and they were equally enthusiastic about the concept. What are your thoughts on this, would you be keep to join a skill swap community and be able to share your skills whilst learning new ones? The precious metal clay can be sculpted like regular clay but there are special ways in which to handle it I was unaware of. Denya showed me a really great technique where I could create a relief effect on the clay. As I love drawing this was so exciting to do! The clay was left to dry out and was then ready to fire. I could not wait to see what happened- it was magical alchemy before my eyes! Firing the precious metal clay. Care needs to be taken with timings and temperatures. Once the precious metal clay was fired and quenched, I polished it with a brass brush and special papers to buff and get a lovely shine and finish. And as if by magic... the brass brush revealed beautiful shiny silver! I loved the alchemical nature of this process and the detailed, delicate effects that were created. Denya also showed me some other techniques like using moulds which were also really amazing. Learning a new and exciting skill in the company of a fellow designer was so much fun! I'm hoping to do more of this (more skill swaps anyone?) as it's a lovely way to learn and support one another's craft. The pendant was polished when I got home and is now a pretty little pendant that I love wearing. Not only does it show off a new skill I now love but also a new friendship formed over a shared love for creativity. After buffing with a brass brush. We then spent some time doing some wax filing and carving (and making loads of mess!) and I showed Denya a few wax methods of taking away and building up. I wish we had had more time as the day ended too quickly but I have promised Denya a visit to my house when my new little studio is ready. One thing Denya shared with me before I left was some stories about her Father. He sounded like an wonderful creative man who taught himself many skills, and shared them with other creatives and artists in the same way that Denya and I did. She opened a box of the tiniest most delicate silver castings that her Father had made; of the many things he did, he had taught himself the art of lost wax casting. How incredible is that! I was really touched that I was able to take a little crab pendant away with me and I am wearing it now, I think it is a really precious piece of jewellery. That's what I love most about jewellery- the story and meaning it holds is what makes it so very special to the wearer. My new leaf pendant next to Denya's Father's crab charm. It's so tiny and I adore it! Also if any of you would like to share your thoughts on a skill swap community, skills you'd love to learn or share, I would love to hear your thoughts! Hello! I hope you're all having a great weekend. Spring has sprung, hooray! I absolutely love this time of year when mother nature wakes from her slumber. At the moment I am designing and making jewellery inspired by wildflowers and botanicals, and am heading outdoors a lot more in search of inspiration. Last week I went into town to drop some pieces off for casting, and had an hour free so decided to visit the Chelsea Physic Garden. I'd been a few summers ago with my Mum for her birthday, we had an amazing lunch in the Tangerine Dream Cafe before exploring the gardens. Founded in 1673 by the Worshipful Society of Apothecaries to study and identify medicinal plants, it's the oldest botanical garden in London; a beautiful little haven tucked away from the hustle and bustle of the nearby King's Road. A warm microclimate is created within its secret garden walls, housing some of the rarest plants and trees, including a grapefruit tree, gingko tree and the largest olive tree in Britain. The beautiful glasshouses house exotic plants and flowers, and the different sections in the gardens showcase the wide range of healing and medicinal properties of the plants and flowers growing there. It's a real hidden gem and I will be coming back in the summer to gather more inspiration for my designs. It was the most glorious day in the sunshine and a perfect way to spend an hour relaxing surrounded by beautiful greenery. Do give the gardens a visit if you are ever in the area. The cafe is also wonderful and the food and cakes are delicious. Where are your favourite gardens in the UK? Hi everyone, I hope you have had a fun and enjoyable February. Time seems to be flying by at the moment. Little shoots and buds are appearing and the days are getting longer, there's that positive feeling of Spring and all the hope that comes with it. I can't wait to see the tulips grow in the garden and in the late Spring for the buttercup fields to appear in the woods where we walk every day. Talking of flowers, I'm working on some ideas for botanical home accessories, so watch this space! I found Winter quite a hard season to get inspired but the humble fern was a constant woodland feature during our chilly walks, so I picked quite a few and made some sketches of them. They are so delicate and fine, but I was determined to make one into a necklace design. Ferns are one of the most ancient plants that grace our planet; They first appeared about 360 million years ago, and most of the ferns that grow today existed about 45 or 50 million years ago. That's when dinosaurs existed. Isn't that incredible? They have been a real inspiration these last few months where the rest of the botanical world lay dormant. I love their delicate textures and colours, and because of their ancient history I think they symbolise something both magical and resilient. It took a lot of time and patience to carve a fern in wax, I did it in intervals as it required a magnifier to see what I was doing, and very tiny tools! In the end I was really happy with the result but hadn't ever tried to cast anything this delicate before, so was a little nervous about how it would turn out. I am really happy with the results and have so many compliments since wearing mine in gold. They are part of our Woodland Wonders collection, and available to buy in sterling silver, gold vermeil and rose gold vermeil, you can see the collection here. Now I am going to start working on carving some wildflowers... I will post about this sometime soon. Enjoy your weekend! Hello everyone! I can't believe we are nearly at the end of January. I predicted this month would be quiet but instead I have ended up busier than normal! I've started a new job teaching visual arts and have been taking on a few illustration jobs as well as keeping on top of orders and replenishing stock. Phew! I've just finished a new fern necklace which is being cast in silver this week, so I will blog about how I made that soon. Working my way through new castings! I was recently asked by Joanna at Adventures and Tea Parties to take part in her "Day in the Life" feature. It's a lovely feature for makers and small creative businesses to share what a typical day is like, and how their businesses came about. I love reading maker's stories so jumped at the chance to write about Astrid and Rose. Joanna is also a maker who also sells her products online, she makes beautiful personalised accessories, I have just ordered a doggy neckerchief for our pooch which I can't wait to receive. I love buying handmade products and appreciate the love and thought that goes into making a product by hand. You can have a read of my day in the life interview here, and see more of Joanna's amazing blog and handmade products here. Hi everyone! Have you had a lovely Christmas? We have just got back from staying at my parent's house and now enjoying some quiet time at home. I love these in between Christmas and New Year days, doing a little bit of work here and there but nothing too taxing. A nice few days to slow down, reflect on the year gone, and see a new one in. A highlight of staying at my parent's is walking at Nonsuch Park every morning. A beautiful 300 acres of parkland which was once the home of Henry VIII's Nonsuch Palace. I find the beginning of winter such a lovely cosy time of year and one that draws me in to spending evenings making things with my hands. There is something comforting, safe and satisfying about it. As the darker nights set in, it is a ritual I look forward to each year. An embroidery I've been working on- my "slow art" project. The immediate and etherial nature of watercolours is something I love. Those smudgy drips of colour have a mind of their own! January and February are harder months and I quite often feel less motivated- but I am determined to continue creating my own colour and inspiration as the dark cold nights press on. To challenge myself I have introduced a hashtag on Instagram, #NestandMake, and I'd be delighted if you would like to join in. It can be anything that's created by hand and with love; from baking, to floral arrangements, sketches, or a rustic flat lay. I would love to see the different interpretations of how we nest and make, and discover more about your winter rituals. Instagram is such a wonderful community; so many things catch my eye and fill me with awe and inspiration, I'm looking forward to see how we all capture that magic of cosiness and creativity. A little woodland faffing with our acorn necklace. Ivy and dried wildflowers collected from the woods made a festive garland for our fireplace. Our buzzy bumblebee necklace against a little sketch of wildflowers. What are you making this winter? What winter rituals bring you comfort and joy? Autumn has been wonderful here this year, we have had many sunny days and little rain. I am so lucky to live so close to woodlands and nature, and have loved watching the seasons change. I'd like to share some of my photos from walks around where we live, to celebrate the shift from Autumn to Winter. Morning light and the magical sparkle of frost. Wildflowers in their winter's slumber. Winter is such a lovely time for me; it's my birthday in December, and Christmas is soon approaching. One thing I find myself doing a lot now is nesting and making; darker nights are spent cosying up by the fire with my sketchbook and a hot cup of tea, or baking cakes to old Christmas jingles. It's a magical time of year. I am keen to carry this in to January and February as these are drearier months to get through, so all the more reason to create colour and loveliness indoors. I quite like the term "nest and make" and am thinking of starting a hashtag this winter on Instagram. Nesting and making. Cosy wintery bliss. What do you love most about winter? Hi everyone! I hope you have all had a good week. Time seems to be whizzing by and the Christmas rush has started. Last Christmas I was totally unprepared for the number of orders I would receive, it burned me out. I was teaching a lot of art classes and taking on extra illustration work and it ended up being too much, there were lots of very late nights and tears (luckily my kind and patient husband stayed up til 2am packing orders with me- what a life saver!). Although it was a shock, it was also a great confidence boost in that I realised I could actually make this a business rather than just a sideline. It helped me organise myself much better this year, to work a bit smarter and rethink the things that were not working business-wise. I feel much calmer this year and it is far less frantic (for now)! Christmas gets me so excited... I get more and more like an excited child each year! This week I have listed our new celestial themed jewellery in the shop. I hope you like them! I wrote about how I made these in my blog post last week so please have a read if you are interested. Lovely delicate constellation necklaces in sterling silver, rose gold vermeil and yellow gold vermeil. I love the way these turned out, I have been wearing my gold orion necklace this week (a winter constellation as my birthday is in December) and have had a lot of compliments! 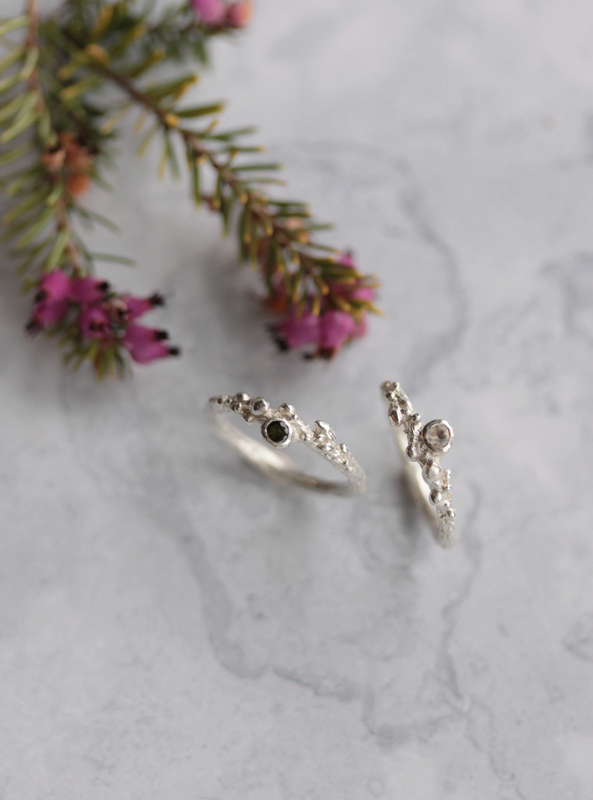 I chose constellations from each season, with the hope that they would make unique birthday gifts for star lovers, or just something delicate, minimal and unusual to wear everyday. You can take a look at the rest of our constellation jewellery here. Hi everyone! It's been a horrible week for a lot of us and it feels sad that there seems to be much hate in the world at the moment. Things feel quite bleak sometimes and hard to understand. In times like these I try to focus on the good of people and humanity, and move forward positively. It is the only way we can have hope for our future generations, to lead with love and compassion, and not hatred. I thought I would write about some new designs I have been working on recently, inspired by the darker winter months. Our dog Pedro barks at night when there is a full moon (he's a pug but thinks he's a majestic wolf), and because I'm a light sleeper I often wake up to gaze at the moon with him, it's so quiet and still in the middle of the night, there is something magical about it. It has been lovely looking at all the stars when the skies are clear. I wanted to make some constellation jewellery, but nothing based on zodiacs as there seem to be a lot of these around already. I decided to look at constellations from different seasons, and chose Lyra, Cassiopeia, Orion and Ursa Major. My ideas always start in my sketchbook. I am always a bit embarrassed to show work at this stage as its just a lot of mess, notes and bad drawings. I felt a million times better about my bad sketchbook when I saw Alan Kitching's sketches at the Pick Me Up exhibition earlier this year; it was literally just scribbles and notes. I think all artists have their unique way of working and I have to remind myself not to be so precious, to have faith in the process and not to get caught up in reaching an outcome. I played around with some more drawing and painting, I love working with watercolour in particular as its such a quick medium. I did these paintings just to get in the mood for all things mystical and celestial. The first picture was inspired by an amazing star embellished dress I saw by Alexander McQueen. I had some wax wire that I thought would be perfect for making the geometric forms of the constellations, and started to experiment with it. It was so hard to work with at first and really frustrating. I used heat to attach the wax together but it melted so fast into messy blobs. Eventually I found a way to make it work and to create textured clusters for the stars. Many attempts made to try to get these right! Hurray! They worked. Now they have been tidied up, with jump rings soldered on, and multiples have been made. I'm at the stage of getting the finished pieces back from the platers, as I have some gold and rose gold versions too. I will post an update about these soon. If you want to follow my process please take a look at my Instagram page as this is where I post daily snippets of my work/life. I'll end this post with a quote which seems apt for this week. I have loved the stars too fondly to be fearful of the night.” -Sarah Williams. Hello everyone! Welcome to my first blog post. I'm not a person who is very good at writing, but I would love to share some of my processes and ideas, and keep you posted with news. I think my blog posts will be visual rather than wordy but will hopefully convey my passion and creativity in an engaging way! I've just recently listed some of our charms in the shop in gold and rose gold. These are our most popular designs from our woodland collection. If you follow me on Instagram then you may know that I am a little bit of a wax carving geek, and the lost wax technique is how a lot of my creations are made. Our rabbit charm carved in jeweller's wax. My work always starts off in my sketchbook as pencil drawings and little notes. Originally I wanted this little bunny to be hopping but as I started to carve him, it changed. I love the way he is sitting quietly, observing the world around him. For this collection I read a lot about the Victorians and their jewellery. Their jewellery is known to be symbolic and sentimental, and often given as gifts to symbolise a significant life event. For example, buttercups feature in many Victorian designs for young women as they embodied all things jovial and youthful. A little buttercup wax. The woods near my house are abundant in buttercups during the early summer when I made this. Once my waxes are carved, I take then to the casters in London and they are cast in metal. I tidy them up, file off the sprue (the small vessel where the metal in poured into the cast) and make sure they are in perfect condition for making a mould. The casters can then make a master mould so I can have multiple pieces made. Each casting is filed, finished and polished by hand before attaching to a chain and sending off to their new home. Our tiny rabbit necklace in sterling silver. I had quite a few requests recently to make these in gold and rose gold. So I took some pieces to the platers in Hatton Garden where they plated them for me. I make sure I get a nice thick plating so the quality is lovely and long lasting. I love the pieces in yellow gold the most, the colour is amazing, and I think they are most in keeping with the era they were originally inspired by. 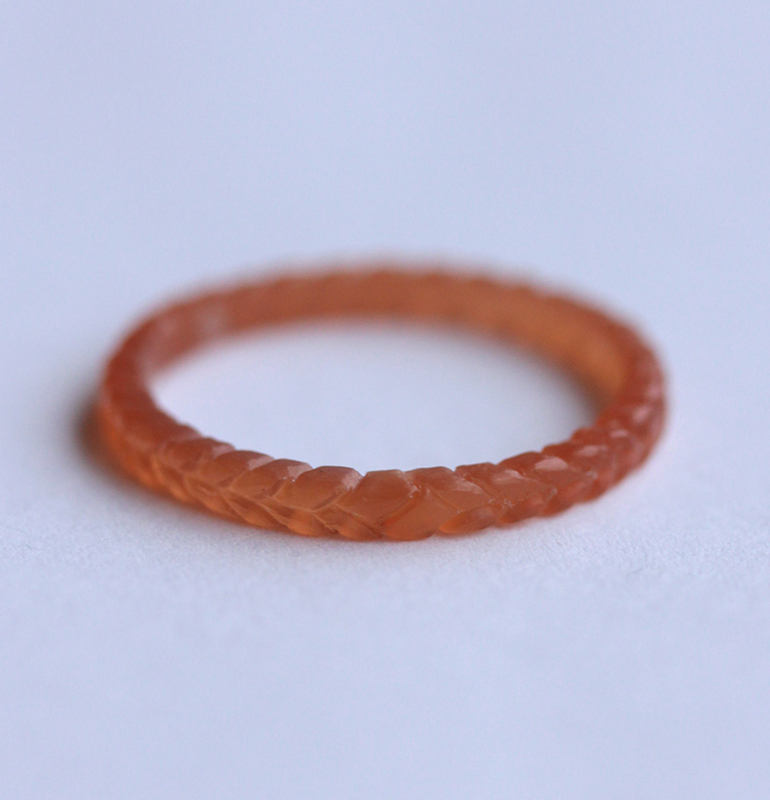 A lot of ladies love rose gold now, and these have had some lovely positive responses too. Mister rabbit glimmering in yellow gold. Our swooping swallow necklace in rose gold. You can see our little woodland charms here. I'm thinking of making a few more woodland creatures next Spring- perhaps a wise owl, a butterfly and a magical fern. What woodland inspired pieces would you like to see? Now the darker days are drawing in I am designing a collection inspired by stars, planets and the night sky. I will write an update about this soon.